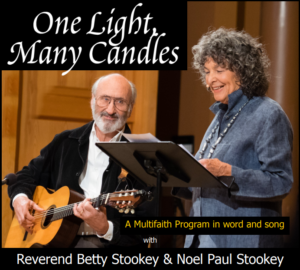 Saturday, October 13 at 7:00 p.m.
On Saturday, October 13th, Betty and Noel Paul Stookey will give a performance of “One Light Many Candles” at the North Windham Union Church starting at 7pm. “One Light, Many Candles” is a multi-faith program in word and song reflecting the diversity and integrity of individual faith seeking a global spiritual community. The message that “One Light Many Candles” spreads, through words and music, is a message that is so important for these times. Their concerts remind us of the joy of God in all our lives, no matter what our background or belief. The quality of Noel Paul Stookey’s singing reinforces the words that Betty shares of a need for all of us to come together in the light of God. Talking about God or about faith in our everyday lives is becoming uncommon, and any such discussion can too easily trigger political tension. That makes this concert all the more important, all the more special in these contentious times. Through the simple pleasure of good music, we are reminded that there is a power and a force in the world that is recognized by many different religions and in many different ways. But beneath the differences that divide us, there is a common need, a common seeking, and a common recognition of a power that connects us all. Please share with your family, friends and fellow worshipers that this presentation will take place in Windham on October 13th, and that everyone will be welcomed. In order to get a small taste of what the evening will involve, please take a moment to visit onelightmanycandles.org . There you will find a link to a 3-minute YouTube video of the Stookey’s presentation in Cambridge, MA. Tickets are $20 for all seats available in advance on-line at www.mwamconcerts.com and through the church office from 9am to noon Monday through Thursday. Tickets will also be sold at the door and seating is general admission. The community proceeds from this show will go to support the Maine Council of Churches. More details are shown on the next page. Please consider using the enclosed poster to encourage folks to attend. We hope you will join us for this very special evening that will touch your hearts and open your minds.